The Delhi government today said that it was planning to put up its vegetable and fruit stalls to tackle rising prices in the city. The government will also stop the export of tomatoes whose wholesale price has gone up to Rs 11.25 per kg. Unlike the funeral that was attended only by a solitary police official, the top brass of the Delhi Police today turned up for the condolence meeting of the slain policeman and ace sharpshooter Rajbir Singh, but none said a word about their dead colleague. ACP Rajbir Singh’s mother, wife and other relatives during the condolence meeting at Chiminya House, Lodhi Road in the Capital on Monday. The National Rural Employment Guarantee Act has huge potential for regenerating village economy in India, but only if its focus remains on the creation of productive assets, says a study. The cashier counts the currency notes carefully, makes an entry in the passbook and hands it over to the waiting customer through a tiny window. But this is no ordinary bank - as both the cashier and consumer are actually street children. Bombardier transportation, the world’s leading supplier of metro vehicles, announced that it had received an order worth 87 million Euros ($ 137 million) for supplying an additional 84 movia metro cars to the Delhi Metro Rail Corporation Ltd (DMRC). CPI national secretary D. Raja and Forward Block secretary Devarajan today visited Bhopal gas tragedy survivors, who have been sitting on a dharna at Jantar Mantar since Friday. Survivors of the 1984 Bhopal gas tragedy on a dharna at Jantar Mantar in the Capital. Delhi finance minister AK Walia’s declaration in the state budget to waive off the outstanding power dues of the Delhi Vidyut Board is an attempt at misrepresentation. The Delhi Police has claimed to have solved the murder of Shashi, 23, who died under mysterious circumstances on Sunday in a guesthouse in the Nizamuddin area of the Capital. A 22-year-old woman was forced into a car and was assaulted by four men early today, another reminder of how unsafe the Capital’s roads can be for women. The incident occurred in North West Delhi’s Pitampura area at around 3 am when the woman and a colleague were going home after a party. The National Herald, the newspaper started by India’s first Prime Minister Jawaharlal Nehru, and its Urdu edition the Quami Awaz will come out with their last editions on Tuesday, April 1, following a notice of “temporary suspension of publication”. A city court today reserved till Friday its order on the bail plea of arms dealer Suresh Nanda and his son Sanjeev, arrested for allegedly trying to bribe an income tax official. A sugar and cholesterol check-up camp was organized by Final Diagnosis on March 29 and 30 2008 in which samples of 2,500 patients were checked simultaneously at 60 centres of Final Diagnosis Ltd in 10 states. The Noida police has booked the youth who had performed stunt on bike on Expressway on Saturday without permission. The police will also investigate the role of On-line Bikers Club. A newly born baby girl thrown in a pond was rescued by a youth and a woman from stray dogs which had brought it out from the pond and were about to devour it. The baby is said to have been thrown into the pond soon after birth by her mother in Hadoni village in Greater Noida on Sunday. With the arrest of seven persons, Amit Kumar, Kumar Vishal, Dr Amit Kumar, Anupam Anand, Nagendra, Ravinder Kumar and Gaurav Kumar, the Crime Branch has exposed a gang involved in impersonation at Foreign Medical Graduate Examination (FMGE) in the Capital. A city court today sentenced a man to life imprisonment for killing his wife, who allegedly had an illicit relationship with another man. With the recovery of a body and the death of an injured labourer in the hospital on Monday, the toll in a building collapse in North East Delhi rose to nine, but the builder, Deepak Garg, remained untraced two days after the accident. The South Indian Bank (SIB) opened its 500th branch at Vivek Vihar in the Capital today. 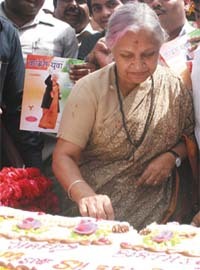 Chief Minister Sheila Dikshit inaugurated the branch. She also inaugurated the distribution of 500 micro credit loans to weaker sections of the society. The Delhi government today said that it was planning to put up its vegetable and fruit stalls to tackle rising prices in the city. The government will also stop the export of tomatoes whose wholesale price has gone up to Rs 11.25 per kg. Chief Minister Sheila Dikshit reviewed the situation in a meeting with Delhi Agricultural Marketing Board (DAMB) chairman Brahm Yadav and other senior government officials. “If needed, the government will put up vegetable and fruit stalls. There is a slight increase in the wholesale price of bitter gourd,” Yadav told IANS. “There is no increase in the wholesale price of vegetables and fruits except for tomatoes because of low arrival. We have suggested the government to stop exporting tomatoes for a few days,” Yadav added. He said that the government would look into the factors responsible for high prices of all vegetables and fruits. “The increased transport cost can be a reason,” Yadav said. Dikshit, who turned 70 today and cut cakes weighing 70 and 51 kgs at her residence and the Old Secretariat respectively, had sought a detailed report from the DAMB on the price situation. The Dikshit-led Congress government is under fierce attack from the main opposition Bharatiya Janata Party (BJP) members for allegedly failing to check rising prices. BJP legislator Vijay Jolly last week even raised the issue in the assembly as a matter of urgent public importance. He drew the government’s attention to a price increase of up to 40 per cent of green vegetables, and 100 per cent in the case of fruits. “Even papaya is being sold at Rs 35 to Rs 40 per kg now as against Rs 20,” Jolly had stated. “The Congress government is least bothered about the plight of common people. It has turned out to be so insensitive,” BJP’s Delhi unit chief Harsh Vardhan told IANS. The commiseration meeting for Singh, who was killed last week by a friend was held at the Chinmaya Mission Centre in South Delhi. Delhi Police Commissioner YS Dadwal’s absence once again disappointed the family and relatives of Singh, who was nicknamed Dirty Harry. Former Delhi Police Commissioner RS Gupta and a large number of Singh’s colleagues in the crime branch and special cell were part of the gathering, but surprisingly none got up to say anything before the assembly of over 500 people seated in the large hall. It was evident that the officials felt obliged to show up at the venue fearing a media lash once again. Senior police officials were riled in the media for failing to turn up at Singh’s cremation at his village near Rewari in Haryana last Monday. 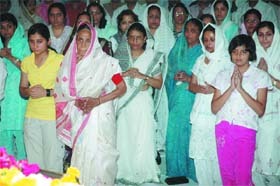 At that time Delhi Police spokesman Rajan Bhagat was the sole senior officer seen standing with Singh’s grieving family. The scene was almost similar a week later too. The senior officials arrived at the condolence meeting venue in their official red and blue beacon cars, leading to a massive traffic snarl. But after their appearance, they soon left without exchanging a word with the mourning family. Relatives were seen standing outside the hall with their hands folded, but none of them said a single word to the guests. However, they murmured among themselves about the exemplary valour of the slain policeman, who is credited with solving the 2001 parliament attack case and the assault on Red Fort in 2000. “Vo sher tha (He was a tiger),” said one relative to another. Among the top officials present were Neeraj Kumar, special commissioner (administration); SB Deol, special commissioner (security); Aditya Arya, joint commissioner (Rashtrapati Bhawan); Deepak Mishra, joint commissioner (armed police) and MS Upadhye, additional commissioner (vigilance). Congress MP from Outer Delhi Sajjan Kumar and the self-styled chairman of the All-India Anti-Terrorist Front (AATF) MS Bitta too marked their presence. Sajjan Kumar told IANS that he had come to pay condolence to the family. But like others, he too left without talking to the family. Singh, who headed the special operation squad, was murdered last Monday at the office of a real estate agent in Gurgaon, a satellite town on the outskirts of the national Capital. The National Rural Employment Guarantee Act (NREGA) has huge potential for regenerating village economy in India, but only if its focus remains on the creation of productive assets, says a study. Carried out by the Centre for Science and Environment (CSE), the New Delhi-based voluntary organisation, the study looked at NREGA implementation across 12 districts in nine states and made a set of recommendations here on Monday. The act is to be extended to the entire country on Tuesday. “The act brings huge possibilities of making a difference to the lives in 45 million rural households. Over the two years that it has been in existence, NREGA has already created half-a-million assets and provided jobs to around three percent of India’s population,” CSE director Sunita Narain said. “This is the world’s largest ecological regeneration programme for building assets - water conservation structures and afforestation - for economic change and we have to realise its potential and make it work,” she added. “Instead of implementing and evaluating the act purely in terms of employment creation, the focus should have been on the real impacts on local development through productive assets creation,” the CSE chief said. The study finds that most of the NREGA money has gone for road construction, instead water conservation and harvesting. This has happened because “irrational wage calculations have made projects like water conservation less lucrative,” says Richard Mahapatra, lead researcher of the CSE study. The programme is also plagued by incomplete and abandoned works and lack of maintenance of completed works, the study finds. Out of 769,582 works under progress, only 158,277 (20.56 percent) have been completed. “People will participate in NREGA only if the programme succeeds in making an impact on their lives,” says Mahapatra. * Measure not just the wage provided but also the asset created and its effectiveness. This will make village development, through productive assets creation, the primary objective. lMake wage payment people and development friendly. Provide a premium wage for development programmes, which will ensure that work done is completed and is useful. lContinue to emphasise water conservation works under NREGA by providing additional incentives. lMake the completion and maintenance of works under NREGA mandatory. lGive importance to afforestation under NREGA by linking it to other forestry programmes - joint forest management or watershed management. lDo more to strengthen village-level planning and decision making by revamping the current operational structures. lEquip panchayats with the necessary personnel and funds for effective implementation of the programme. Narain said: “This is a programme not just for short-term relief during drought or distress. It is a programme for long-term relief against drought. The Bal Vikas Bank, or Children’s Development Bank (CDB), is a unique initiative by a Delhi-based NGO — Butterflies, whose primary aim is to inculcate a sense of saving money in street children, who otherwise end up wasting whatever little they have on gambling or drugs. Suman Sachdeva, project development manager of Butterflies, said that the programme, which began in 2001 and runs from 11 night shelters spread across the city, does more than just help children save money. “The Children’s Development Bank is not a stand alone programme. Since it is run by and for children, it inculcates in them a sense of responsibility. And it also brings them on the path of education since one can’t be expected to maintain ledgers and passbooks without being literate,” Sachdeva told. Trained by volunteers of HSBC bank, the young officials of CDB, mostly between 12-14 years, are as professional as they get. The members are either rag pickers or work in tea shops and dhabas. Since its inception, CDB has grown from 20 members to 1,700 in Delhi alone. Rakesh Kumar, all of 12 and a runaway from his home in Bihar, is the manager of the bank’s Nizamuddin branch. Sharp at 6:30 in the evening, when the bank opens after children return from “work”, Kumar walks in. Dressed in a chocolate brown pair of trousers, a white printed shirt and hair neatly combed back, he enters his cubicle painted bright yellow and pink. Soon a number of young customers queue up in front of the cashier’s window with their earnings of the day, anything between Rs 20 and Rs 50. Members get a 3.5 per cent interest return on their savings. “It feels good to be able to handle such a responsibility,” Kumar said as he made an entry in the passbook and handed over Rs 50 to a customer, as young as him. “It is a matter of pride to be the bank manager. We have regular meetings and choose a different bank manager every six months,” he added. Apart from the bank timings, there are other rules that the children have made. For instance, it is unanimously decided that kids selling pornographic material or indulging in stealing, pick- pocketing and substance abuse will not be given membership of the bank. Like any other bank, CDB, whose overall functioning is seen by the volunteers of the NGO, has two types of accounts - the ‘jama khata’ or savings account where a minimum of Re 1 can be saved, and the ‘chalta phirta’ account or the current account. “One can also take loans from the bank. The request is, however, carefully reviewed by a panel of nine members comprising NGO volunteers and children. These loans are more often than not for business propositions,” Sachdeva said. The membership of CDB comes to an end when a child turns 18. He or she then has the option of seeking membership in other affiliated banks like ICICI or Andhra Bank. “As an offshoot of this programme, we are now planning to get some of the children who have turned 18 to get trained by institutes such as the Pusa Institute of Hotel Management so that they can be absorbed by catering agencies later,” Sachdeva said. “Hopefully, we should start the programme by June this year,” Sachdeva said. The CDB has its branches in Kolkata, Chennai, Muzaffarpur, Srinagar and Leh, besides the 11 locations in Delhi. Afghanistan, Bangladesh, Nepal, Pakistan and Sri Lanka also have branches of CDB, which are run by partner organisations. For instance, in Afghanistan, Aschiana is the key organisation that runs CDB there. The jury comprised Coomi Kapoor, contributing editor, The Indian Express, Alok Mehta, editor of Outlook Saptahik, Sachindanand Murthy, editor of The Week. This was followed by a panel discussion on media, freedom and democracy with eminent panelists from across South Asia. Shekhar Gupta, editor in chief of the Indian Express said, “While traveling at a series of seminars in Pakistan, I said something which is very applicable today, the peculiarity of the South Asian politics in all nations that comprise it is that it has some kind of a free media. The essence of the situation is that in the worst of times no nation in S. Asia has had complete curbs on the freedom of the media.” He added that the South Asian inheritance is the presence of a free media and a judiciary despite everything and this encourages hopes of democracy in the region. “We have been through an eventful decade and since parliamentary elections in February this year, the government in Pakistan has shown good judgement and we are moving towards becoming a democracy and the Pakistani media has made quite a contribution to this through the struggle put by them in favour of a democratic government,” said Talar Hussain, from Aaj TV, Lahore and the Newsline, Karachi. Hussain added that Musharraf last year had muzzled the media by the ordinances he imposed that blacked out the broadcast media. The current government has decided to go ahead and revoke these restrictive ordinances this is the result of a struggle put up by at least 77 imprisoned jourmalists. Hussain says that implementation of this decision is keenly awaited by the media in Pakistan. Sunanda Deshpriya, Center for Policy Alternatives from Colombo comments, “We have media freedom in Colombo but we have no safety. This is the big dilemma, there is good coverage of news but journalists are a threatened community in Sri Lanka and it has been so for decades. Last year 14 journalists were killed.” Deshpriya mentions that in Jaffna there are no journalists left due to deep threat and too many killings. Bombardier transportation, the world’s leading supplier of metro vehicles, announced that it had received an order worth 87 million Euros ($ 137 million) for supplying an additional 84 movia metro cars to the Delhi Metro Rail Corporation Ltd (DMRC). The latest order follows on from a contract awarded in July 2007 to supply 340 movia metro cars, making a total of 424 metro cars ordered so far. As per the contract, the DMRC has requested a change in the configuration of the trains and the revised scope will be 37 trains of 4-car and 46 trains of 6-car. In the Phase II expansion of Delhi Metro, the bombardier movia high-capacity vehicles will transport an impressive four million passengers every day, reducing their journey time and alleviating the heavy traffic congestion and pollution prevalent in the city. The Phase II expansion extends the existing network by 60 km covering all major destinations in the east-west and north-south corridors of the city, which is inhabited by around 16 million people. The new vehicles will be produced at Savli in South Gujarat, where bombardier is setting up a facility for manufacturing and assembly of coaches and bogies. The movia metro vehicles integrate the world’s most advanced technologies in metro vehicle manufacture, such as stainless steel bodies and the mitrac propulsion and control system. This contract envisages a design approach that enables a high degree of localisation and easy transfer of technology processes for a mass transit vehicle designed to meet the requirement for a rapid, efficient and cost-effective high performance metro. Bombardier transportation India MD Rajeev Jyoti said that his company was delighted to receive this additional option contract to supply movia vehicles in New Delhi. ‘’It is an excellent endorsement of our growing relationship in India, which is going from strength to strength, with the opening of a new production facility at Savli, accompanied by a large local recruitment programme,’’ he added. As many as 50 Bhopal survivors had arrived at Jantar Mantar on March 28 after walking 800 km from Bhopal to Delhi. They are demanding that a national commission be set up to implement rehabilitation schemes and environmental redemption. They want the government to commit that it will pursue legal action against Dow Chemical and Union Carbide. Raja appealed the Centre to be more sensitive to the plight to Bhopal tragedy survivors. He assured the survivors that his party would take up their issues both inside and outside the Parliament. “It is distressing to see that influence of multinational corporations is increasing on the policies of the government. Union Carbide is one of the most notorious multinational corporations in the world. There are apprehensions regarding as to how long will the legal case continue and whether the UPA government is determined to fight the case in the interests of victims,” he questioned. “The government must fight the case in the High Court and secure money from Dow for clean-up. It must extradite Anderson and make Dow pay the dues. It should not come under pressure from multinationals and should ensure that Bhopal survivors are not left to live like orphans,” he stressed. Devarajan also promised to take up the matter in the Parliament. “Many people are suffering at the hands of multinational corporations. The government is unable to take any steps. It is only taking cosmetic decisions. 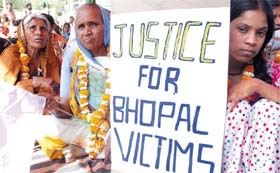 The co-ordinating committee on Bhopal set up by the government has met just twice,” he said. Delhi finance minister AK Walia’s declaration in the state budget to waive off the outstanding power dues of the Delhi Vidyut Board is an attempt at misrepresentation. The declaration is a sop for five lakh consumers, who were held up in arrears or litigation on this account, said People’s Action, an NGO. VK Arora, a member of People’s Action said, “I feel the minister should be charged with contempt and the Speaker should take immediate action against him for his inaccurate, fraudulent and false statement in the House”. BS Sachdeva, former executive director, Power Finance Corporation and a member of the sub-committee on power issues said, “The waiver reeked of selective application of norms. On one hand consumers are being harassed by illegitimate demands of Discoms and false theft cases while on the other, large swathes of consumers have been let off for no reason. It is the honest consumer who will pay for this,” he said. Shashi had come to Delhi on a sightseeing trip with three friends — Ashish, Manoj and Savi. On Sunday, Ashish and Manoj rushed her to a neighbouring hospital, where they told the doctors that she had tried to commit suicide. However, the doctors, on noticing the stab injuries on her neck and abdomen, called the police. Shashi eventually died in the hospital. After admitting her, the duo left their Indica car near Hazrat Nizamuddin station and tried to escape, but were apprehended by the South district police. They disclosed that Shashi had joined them mid-way while they were coming to Delhi from Jaipur. The couples checked in the Central guesthouse on Friday night. It was also revealed that Shashi was having an affair with Ashish, who did not approve of her being friendly with other boys. On Saturday, the couple picked up a fight, which got violent. Ashish attacked Shashi with a knife causing her serious injuries. On hearing Shashi’s screams, Manoj came to the room, but instead of stopping Ashish, he helped him clean the room. A 22-year-old woman was forced into a car and was assaulted by four men early today, another reminder of how unsafe the Capital’s roads can be for women. The incident occurred in North West Delhi’s Pitampura area at around 3 am when the woman and a colleague were going home after a party. Both work in a call centre in Gurgaon on the outskirts of Delhi. According to her colleague, four men who appeared to be in their 20s chased them in a Mahindra Jeep and forced them to stop. “They immediately seized my bike key. There was a heated argument between us. They called us names and brutally assaulted both of us,” the colleague stated in his complaint. According to the police, the men assaulted the girl in their car before dumping her in the same area. The editions of both dailies will carry a terse notice on Tuesday announcing the “temporary suspension”, said its editor-in-chief TV Venkitachalam, who was associated with the National Herald for 20 years. “The temporary closure of National Herald and Quami Awaz was announced by the management of the Associated Journals Ltd, which publishes the paper,” Venkitachalam told the IANS. The National Herald and Quami Awaz Employees Union and Congress leaders had worked out the modalities towards a final settlement for the 265 employees, including about 40 journalists of the English and the Urdu editions published from the Capital. The employees will get their cheques for voluntary retirement scheme on April 2, as April 1 is a bank holiday. Overstaffing, mainly of the press and non-journalists, and also lack of advertisements revenue are said to be the main causes for the newspaper running into major losses. Central Bureau of Investigation (CBI) special court judge IK Kochhar gave the decision after hearing arguments from prosecution and defence counsel. “Nandas were in touch with Income Tax director Ashutosh Verma from February 7 till March 8 and made 94 calls to one another. We are investigating this matter,” argued CBI counsel VP Singh, objecting to the bail request. Last week, the court had sent the father-son duo along with Indian Revenue Service officer Verma and chartered accountant Bipin Shah to judicial custody till April 11. The four had allegedly gathered in a Mumbai hotel room to negotiate the bribe amount to be paid to Verma. CBI sources said that Verma had struck a deal for Rs 100 million. A sugar and cholesterol check-up camp was organized by Final Diagnosis on March 29 and 30 2008 in which samples of 2,500 patients were checked simultaneously at 60 centres of Final Diagnosis Ltd in 10 states, including Noida, Delhi, Uttar Pradesh, Uttranchal, Haryana, Punjab, Himachal Pradesh, Jammu and Kashmir, Rajasthan, Madhya Pradesh and Chhattisgarh. All the samples were said to have been checked free. Dr (Mrs) J Bhatia of Final Diagnosis said that every year some 10% new patients are identified with diseases like diabetes and thyroid during these camps. Thyroid is mainly women’s problem which is accentuated when menopause occurs in women. T3 TU TSH test is advised every three months and treatment is quite simple—just one tablet per day. But a lot of precautions are needed. Women approaching menopause age generally feel loss of appetite, heaviness, weakness and lethargy. High cholesterol is a common problem which affects heart, Dr Bhatia said. Final Diagnosis is an ISO 15189 certified laboratory, the only one of its kind in Noida. Normally samples of about 700 to 1000 patients are tested in a month, Dr Bhatia said. It was for the third time in the last two years when such a large-scale event was organized in north-central India at the same time by Final Diagnosis. Final Diagnosis is an NABL accredited lab as per ISO 15189: 2003 in Noida. It’s the top accreditation agency in India for competence and quality control, she informed. According to Dr Bhatia, 2476 patients had got registered during these two days. The tests were performed on completely automatic facility available in the centre. “We have opened three new centres at C-499 Sector Alpha-1, Greater Noida, G-364, Abhay Khand-3, Indirapuram and Nehru Nagar at Ghaziabad, she added. A police team had gone to Delhi in search of the biker but could not trace him. It may be added that some young men try to create speed and stunt records of bike racing on Expressway on rear wheel. Two young men recently died while performing stunts and racing on their two-wheelers at high speed on the Expressway. Some of these bikers say DND is their favourite stretch for racing to establish records. On Saturday, a youth Sunny Matharoo, resident of Geeta Colony in East Delhi had raced his bike on rear wheel only with front wheel lifted in the air all the time, for a distance of 12 km. He had not sought permission from any authority for performing the hazardous feat. 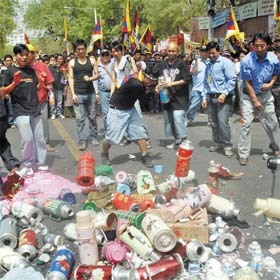 This stunt was also shown by some TV channels. Inspired by the media coverage, some more bikers collected at the Noida, Greater Noida Expressway on Sunday morning with their racing bikes but they were shooed away by the police. It has almost become a craze with speedsters to throng the Expressway every weekend. The woman, Shama, is said to have taken the newborn girl into her lap. The youth, Mohd Shafi, and Shama had shooed the dogs away and took charge of the newborn. Reena, wife of Nepal Singh of the same village, was so moved at the sight that she offered to adopt the child. Later, the Bisarakh police got the newly born baby medically examined and on SDM’s orders handed it over to Reena who already has two sons of her own, Akash and Vikash. Reena said she would bring up the girl as her own daughter. Some villagers felt that the girl was the offspring of an unwedded mother, while others said she had been abandoned as it was a girl. One girl had earlier been abandoned by a woman at a bus stop while a Delhi resident had left his daughter on Hindon river bank near Kulesra. Inputs were received regarding rampant impersonation at FMGE. A team was constituted as per the information and a check was conducted at Kendriya Vidyalaya in Jawaharlal Nehru University. It was also revealed that there was a racket behind deputing the Indian doctors to sit for the examination, which is mandatory to be cleared by the doctors holding foreign degrees. Seven persons were arrested from the spot. Further investigation is in process. Additional sessions judge Reena Singh Naag awarded life imprisonment to Vikas Bansal, who killed his wife Radha on October 21, 2005 and messed up the things in the house so that it looked like a robbery. Vikas, who married Radha in 2003, used to allege that she was having an affair. According to VA Joseph, SIB has prepared a strategic business plan to touch the Rs 75,000 crore mark comprising Rs 44,000 crore under deposits and Rs 31,000 crore under advances by 2012-13 fiscal. In the sphere of financial inclusion, the bank has made an initiative by launching a project ‘Money lender free- village’.